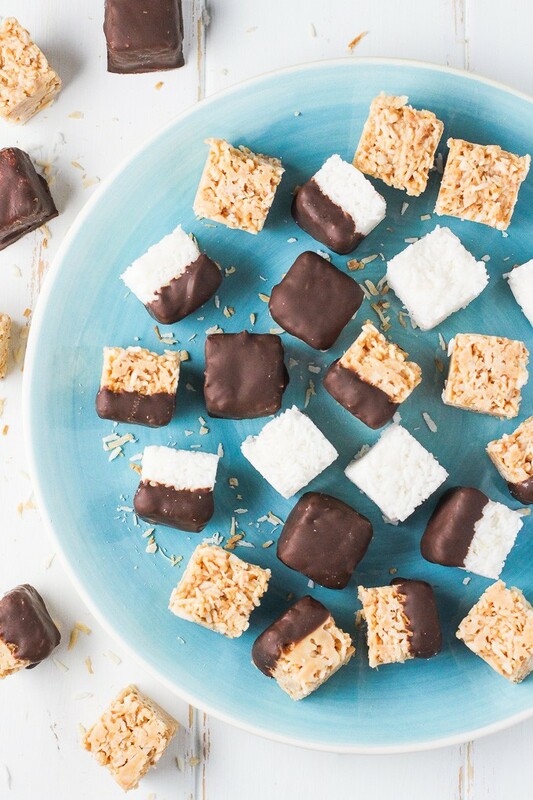 These healthy coconut bites are made with two ingredients – shredded coconut and chocolate. And even better, there is an option to make them using only one ingredient instead of two. 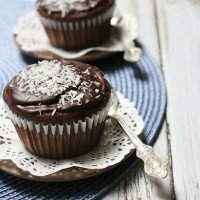 If you prepare them without chocolate, you will only need shredded coconut. The coconut bites without chocolate make a pure coconut snack with no added sugar, perfect for snacking throughout the day. 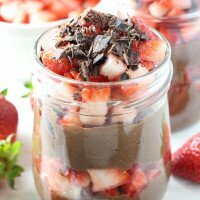 If you dip them into melted chocolate, you will get a light dessert which is perfect for satisfying a chocolate craving. The chocolate covered variation has a bit more sugar from the melted chocolate but is still better than most chocolate bars out there. And you can also make these coconut bites using toasted coconut which adds wonderful caramel flavor. If you are like me and can’t decide which one you prefer, just make all three. Each option serves a different purpose, and the snack will last a few weeks in the fridge. I first posted this recipe in June of 2015. The recipe became popular very fast, and many people loved the coconut bites. Now, I use a silicone ice cube tray to shape the coconut bites, and it’s really easy to do. So, two years later, in June of 2017, I posted the new step-by-step photos and the updated instructions. I also added a new coconut bites variation made with toasted coconut. 1. A food processor or a high-end/high-quality blender which is capable of making nut butter. Please note that a regular blender can’t be used to make these coconut bites. When in doubt, check with the manufacturer. 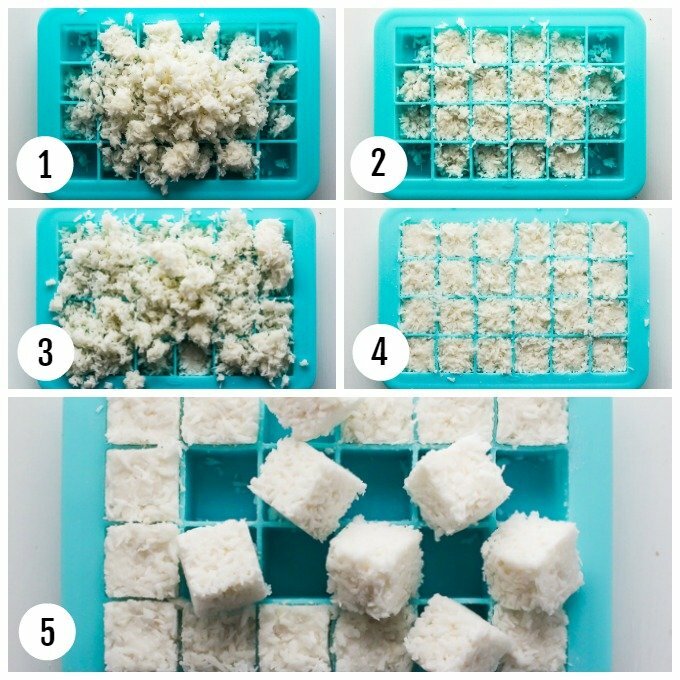 If you don’t have a silicone ice cube tray, you can still make the coconut bites using a measuring spoon which is 1/2 tablespoon in size. It will take longer, but it’s possible. This was my original method of making the coconut bites, and I had been doing it that way for almost two years. The method is described in detail in the recipe section below. The process of making the coconut bites consists of three steps. First, you make the coconut paste a.k.a coconut butter. Then you mix the coconut paste with the shredded coconut. Lastly, you have to shape the coconut bites using a silicone ice cube tray or a measuring spoon. There is also an optional step of coating the coconut bites with melted chocolate. All the steps are described below and illustrated with the step-by-step pictures. I received a lot of questions about this step of the recipe. So to make the instructions more clear and to give you an idea of how the coconut paste looks as it’s being processed, I took the pictures of the paste at each stage. I also listed the time of processing at the bottom right corner of each picture (see the image below). Place the shredded coconut into the food processor. Set a timer for 6 minutes and start processing. After about 1 minute, the shredded coconut will start clumping together. It’s a great start, keep processing. 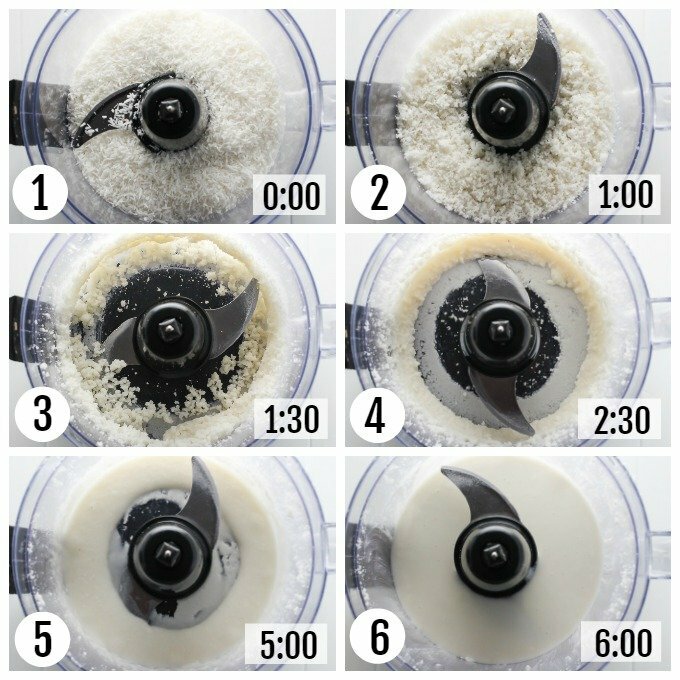 At the 1 minute 30 seconds mark, the coconut mixture will start sticking to the walls of the food processor bowl. Stop the food processor and scrape the coconut paste down with a spatula. Close the food processor and keep processing. At the 2 minutes 30 seconds mark, the paste will start getting more liquid. Stop the processor and scrape the walls with a spatula. Don’t forget to scrape the white layer that forms at the bottom of the food processor bowl. Between 2 minutes 30 seconds and 5 minutes, keep processing the paste but make sure to stop and scrape the paste down with a spatula as needed. At the 5 minute mark, the paste will be almost liquid. Give it one last swirl. At the 6-minute mark, you should have a runny paste which will appear smooth but will have a slightly grainy texture. Please note that the timing may vary depending on many factors such as the power of the food processor, the sharpness of the blade, the quality of the shredded coconut, the amount of shredded coconut, room temperature, etc. Once the coconut paste is ready, transfer it to a mixing bowl. 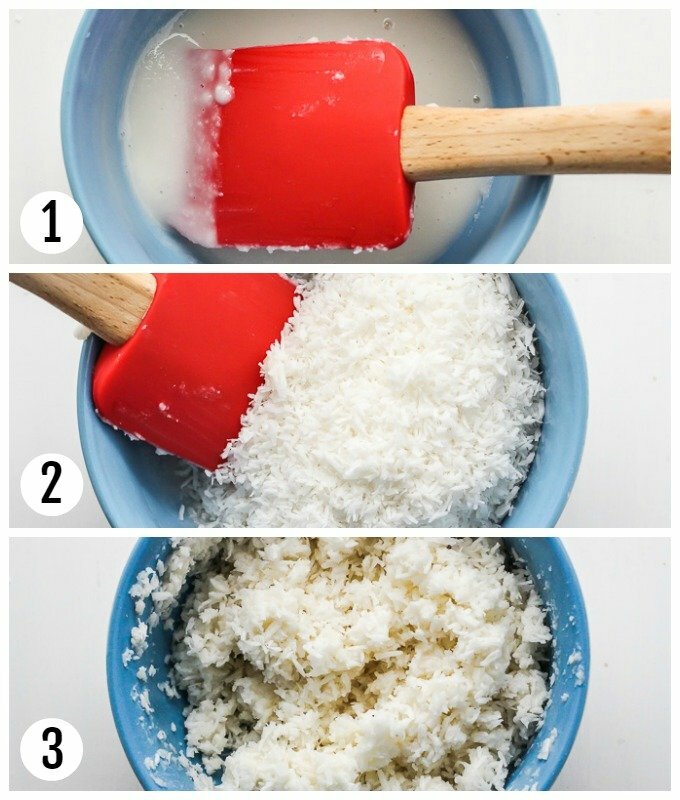 Add the shredded coconut and mix well until the shredded coconut starts to clump together. 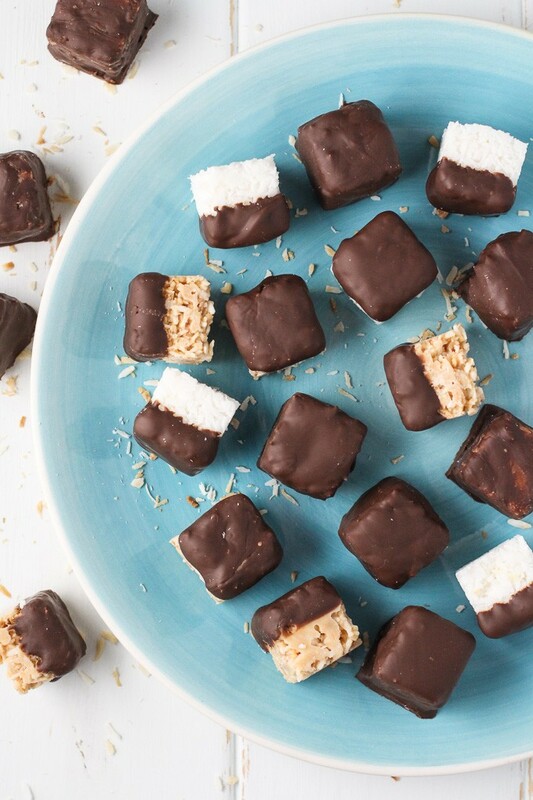 The easiest and fastest way to shape the coconut bites is by using a silicon ice cube tray. Scoop about a half of the coconut mixture onto the silicon ice cube tray. Press the mixture into the cells using your fingers. Add the rest of the coconut mixture. Distribute it equally between the cells and press tightly. Place the ice tray in the fridge for about 2 hours. Once the coconut bites firm up, gently bend the ice tray to loosen them up until the coconut bites pop out. Please note that it’s also possible to shape the coconut bites using a measuring spoon. 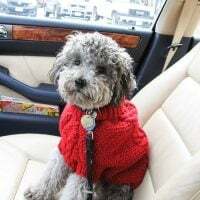 The method is described in the recipe section below. 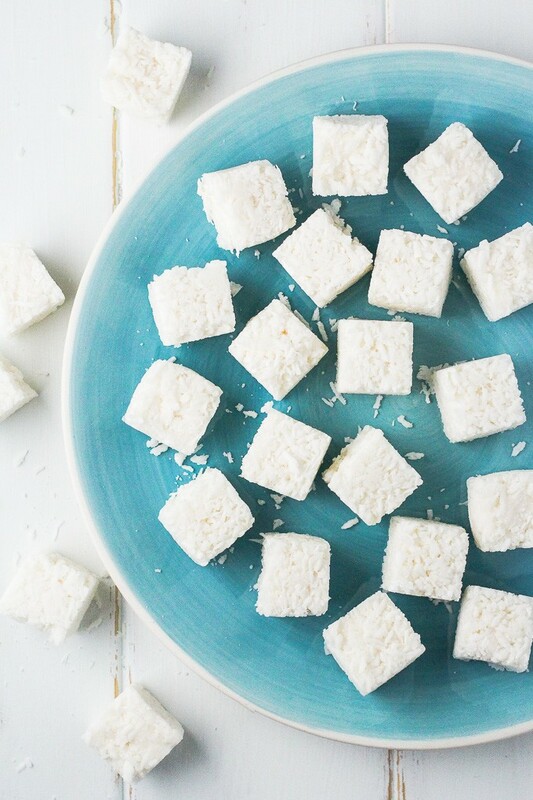 1-ingredient coconut bites make a great healthy snack. They are sugar-free and perfect if you are looking for a low glycemic option. Sugar-free toasted coconut bites are another tasty low glycemic option. They are made exactly like the plain white coconut bites just using toasted shredded coconut. You can easily toast plain shredded coconut on the stove top. Takes about 5 minutes. Dip your coconut bites into the melted chocolate to create a yummy dessert. 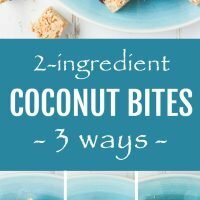 You can fully coat the coconut bites or just dip them half-way to keep the sugar content low. 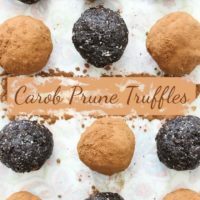 If you are looking for more healthy low-sugar dessert ideas, check out these Carob Prune Truffles, these No Bake Oatmeal Peanut Butter Bites, and these Almond Flour Chocolate Cookies. 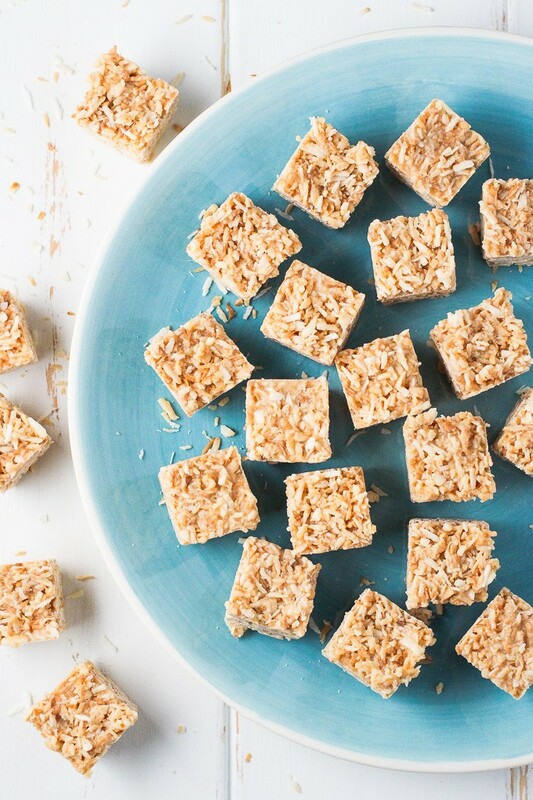 These healthy coconut bites are made with only two ingredients. The recipe includes step-by-step pictures and two sugar-free options. Place 1 1/2 cup of the shredded coconut into a food processor, pulse a few times and process for about 6 minutes until you get a white paste which will appear smooth but will have a slightly grainy texture. Scrape the walls of the food processor bowl with a spatula as needed. Refer to the blog post for the step-by-step photos and instructions. Transfer the paste to a bowl. Add the remaining 1 cup of the shredded coconut and mix until combined. Cover a cutting board or baking sheet with parchment paper. Press the mixture into each cell using your fingers. Distribute the mixture equally between the cells and press tightly. Place the ice tray in the fridge for about 2 hours. Place the bowl with the coconut mixture in the fridge for about 15 to 20 minutes. To shape coconut bites, scoop the coconut mixture with a measuring spoon which is 1/2 tablespoon in size. Press the mixture firmly into the spoon with your thumb, and pop out the coconut bite. They will have a shape of half a ball. Place the coconut bites on the parchment paper with the flat side down. Once you are done shaping all coconut balls, place them in the fridge for about one hour until firm. 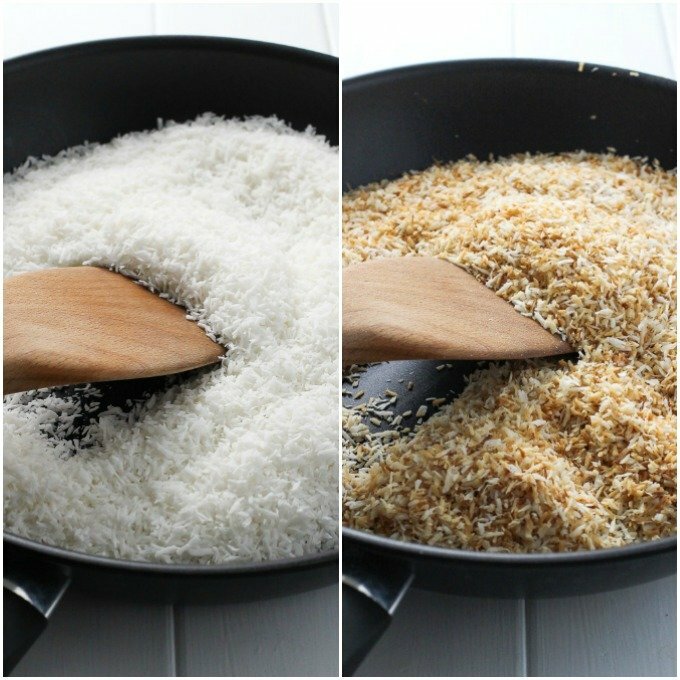 Mix the coconut paste with the rest of the shredded coconut to make the coconut mixture. Shape the coconut mixture using the preferred method. To toast the shredded coconut, pour all the shredded coconut onto a skillet and start warming it up over medium heat. Make sure to always stir the coconut with a wide wooden spoon. After about one minute, the coconut will become fragrant and will start changing color. Toast the coconut until golden brown for about 5 minutes. Once the coconut is toasted, transfer it on to a plate right away (it will continue toasting and might burn if left on a hot skillet.) Let the coconut cool a little bit and then pour it into the bowl of a food processor. Mix the coconut paste with the rest of the coconut. Make the plain or toasted version above. Melt the dark chocolate. Dip the coconut bites half-way into the melted chocolate or, using 2 forks, dip them fully into the chocolate to cover. Place the chocolate covered coconut balls back on the parchment paper. 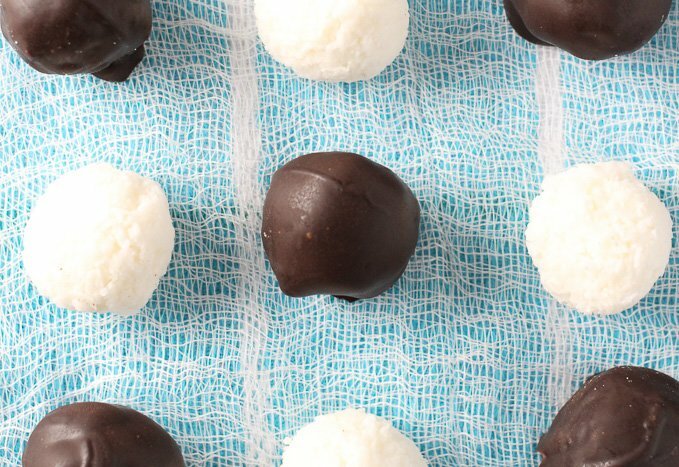 Once all coconut balls are covered in chocolate, place them in the fridge. Refrigerate for 1 to 2 hours until chocolate is set. 1. Please refer to the blog post for the step-by-step photos. 2. These coconut bites keep well in the fridge for a few weeks. 3. Nutrition information is a rough estimate for 1 of 24 chocolate covered coconut bites. This recipe is genius! 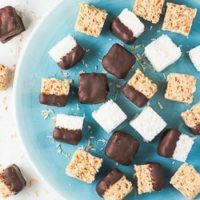 I didn’t know you could blitz coconut into this kind of deliciousness and I love that you used an ice cube tray! Ooh!! These look like little bites of tropical goodness! 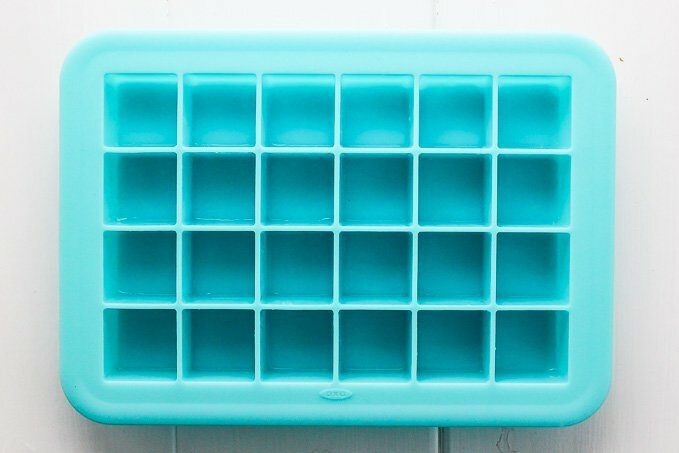 Love the idea of using the ice cube tray. Genius! These are incredible! Like mini bounty bar bites! You had me at coconut. These look absolutely delicious! Hi there. Love the recipe. Must we keep this on the fridge at all times? How long out of the fridge can it withstand? Hi there! It depends on the room temperature. 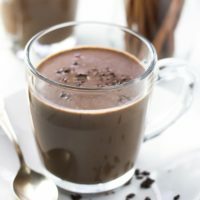 Coconut oil starts to melt around 24 C / 76 F, so if it’s close to this temperature, the coconut bites will become softer and might fall apart if they are not fully coated in chocolate. If it’s cool, they will be just fine out of the fridge. I am currently working on an updated version of this recipe which will be posted in a few days. 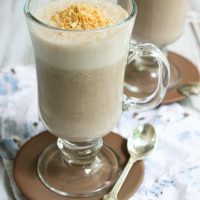 It will include new step-by-step pictures and the simplified instructions as well as an option to make the coconut bites using toasted coconut. If you want to wait a couple of days, I can let you know once it’s out. These were delicious however I had a hard time making the paste. I tried three different blenders/food processor and for about 20-30 minutes. As a matter of fact I ran one blender so long it burned up. Please help me for the next time. Also keep in mind that shredded coconut can sometimes dry out in the package. In this case, it helps to add a little bit of melted coconut oil. Start with about ½ tablespoon. If you have difficulty forming the balls, make sure that the mixture is cool enough as you would use the warmth of your hands to sort of melt the balls a bit to create the desired shape. I hope this helps. 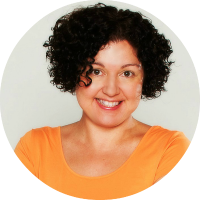 Thank you for sharing the Kitchn article on coconut butter! I tried making these last night and ended up with a sandy mixture that will never in a million years be manipulated into ball shapes, lol. I’m curious how you were able to make the paste in just 4-6 minutes; the Kitchn article says to blend/process for nearly 20 minutes! I was definitely unable to make the paste in 6 minutes of processing. Hi, Katie! I’ve noticed the difference in the processing time. I make these very often and I’ve never had to process it for that long, maximum 8 minutes. I think it depends on the quality of the shredded coconut and the power of your food processor. Also, they are making coconut butter to be consumed as butter, but for the purpose of making the snack, it’s fine if the paste is a bit grainy because you are going to mix it with the rest of the shredded coconut anyways and the grains won’t be noticeable. The trick is to place the mixture in the fridge otherwise you won’t be able to shape the balls. I recently started shaping them into half balls instead of trying to make them super round. I just push them into a measuring spoon, press, and pop them out. I find it takes less time and if I am making them just for us to eat the shape is not that important. Also, sometimes shredded coconut can dry out in the package. In that case, I add a couple of tablespoons of melted coconut oil. Let me know if you have any other questions. I am planning to update this post and make step-by-step photos, so I am interested to know what questions people have when making these. 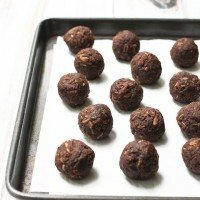 I love that these are healthy, sweet and simple to make! I can’t wait to make them!